Yesterday I sneaked a late afternoon walk out a raw, windy, dreary Sandy Point in West Haven, CT. Not expecting much honestly, I was surprised to kick up several sparrows as I began walking out the base of the point. 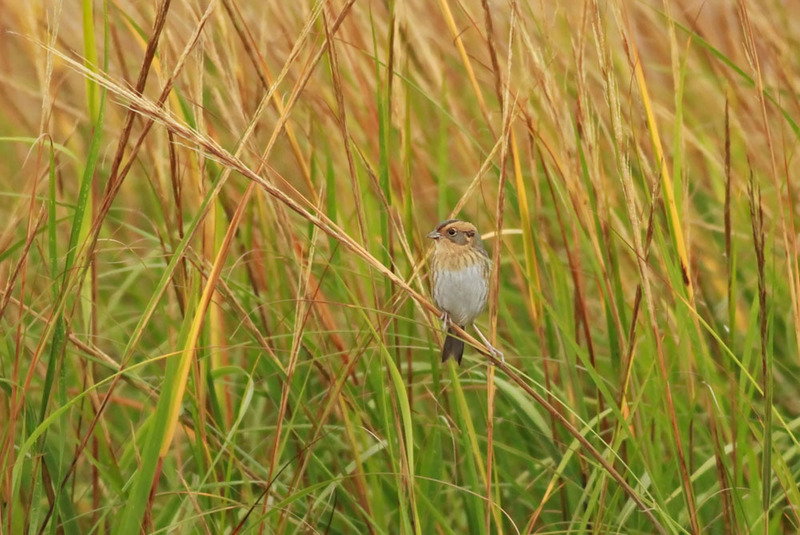 Among them was a nice-looking NELSON'S SPARROW. 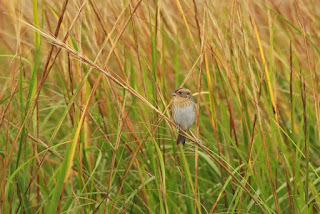 Getting the sparrows to tee up for more than a few seconds was a challenge, as they were driven into the vegetation by the strong winds. Further out towards the point a MERLIN strafed a flock of about 20 HORNED LARKS, among which were two LAPLAND LONGSPURS. 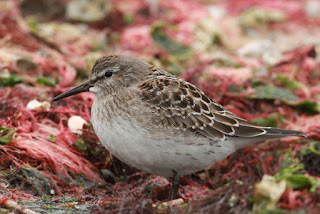 The birds were surprisingly approachable once they landed, preferring to hunker down rather than take flight. I was about to photograph the longspurs when I ran into Tony Amato, who reported seeing BAIRD'S and WHITE-RUMPED SANDPIPERS at the tip of the point. 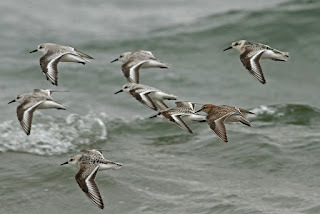 So I abandoned the grassland birds in favor of the shorebirds. We refound the sandpipers without much difficulty. 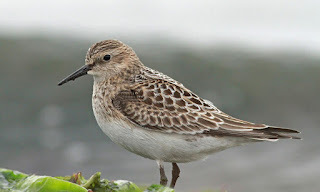 The shorebird flock consisted of about 35 Sandering, 2 Least Sandpipers, 2 Semipalmated Sandpipers, a White-rumped and a Baird's. Not bad diversity there! Both the White-rump and the Baird's were juveniles and were also quite approachable. 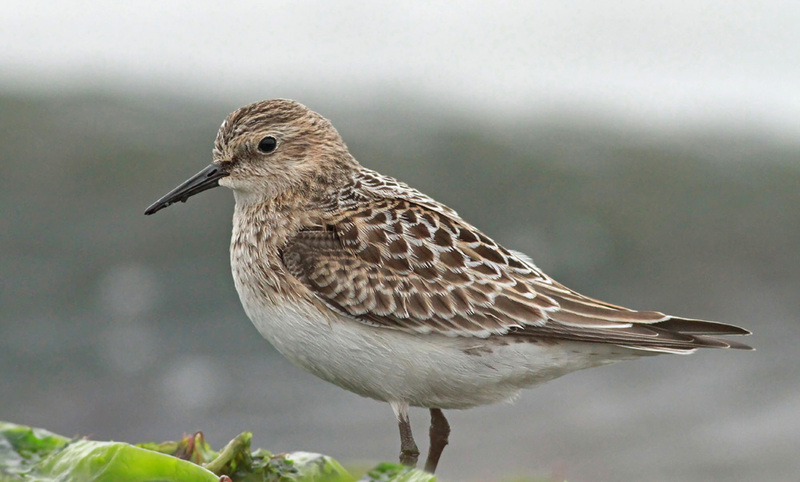 Nearly all of the Baird's Sandpipers we see in New England are juveniles, from mid-Aug to early Oct. Occasionally a late July adult is seen, but most of the adults migrate down the center of the continent. In contrast, most of the White-rumps I see here during fall migration are adults, so this juvie was great to see. 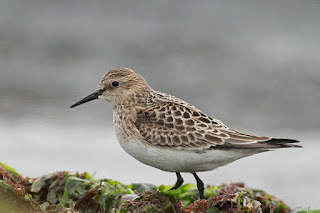 Juvenile 'rumps are late arrivals at our latitude...typically appearing right about now.